For scholars of the Renaissance recovery of ancient literature and its transformative effect on early modern thought, a clear understanding of the sequence of copying, dissemination, and eventual print publication of rediscovered manuscripts is vital to tracing the influence of individual authors and works in the many European centers of study. 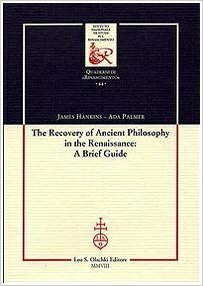 The Recovery of Ancient Philosophy in the Renaissance: A Brief Guide, by James Hankins and Ada Palmer, shows at what point the major texts and sources of ancient pagan pholosophy became available in Renaissance Europe (1350-1600) and which translations and commentators shaped their original reception. Dates of first printing and the most important commentaries are covered, with entries organized by philosophical school.